I wrote this short essay for the Amana Collection website on the work of Naoya Hatakeyama. In the simplest terms, Naoya Hatakeyama could be described as a landscape photographer. While this appears to be a neutral characterization—little more than the description of his chosen subject—the term is more loaded than it may seem. Tied to a certain romantic conception of the landscape that stretches back beyond the birth of photography itself, it not only describes a photographic subject, but also suggests an approach to that subject, and perhaps even a moral or ethical stance on behalf of the photographer. In the last fifty years, the practice of landscape photography has shifted away from a celebration of the beauty of the natural landscape to focus on the threat posed by man to nature’s sanctity or indeed survival. In the course of Hatakeyama’s career, landscape photography has been overwhelmingly driven by this fraught relationship between man and nature. The seminal New Topographics exhibition held at George Eastman House in 1975 brought together a new generation of photographers who took the post-industrial American landscape as their subject and the issues addressed in this exhibition have arguably continued to define the practice of landscape photography up until the present day. In fact the show’s subtitle, Photographs of a Man-Altered Landscape, could still be used in relation to a significant majority of contemporary photography in this field. Like many others, Naoya Hatakeyama has focused his work on these points of convergence between man and nature, from his first series Lime Hills which explored the hundreds of limestone quarries scattered throughout the Japanese archipelago, through his many series on the city of Tokyo which he calls home, to his most recent work on the destruction and rebuilding of his native town of Rikuzentakata in the wake of the earthquake and tsunami of March 11, 2011. Unlike many of his peers in Japan, Hatakeyama has photographed foreign landscapes just as frequently as those of his homeland, from his images of the towering slag heaps of Northern France in Terrils to his metaphor for the chaos of the modern media age, Slow Glass, which was shot in the UK. But whether they are domestic or foreign, his photographs reach beyond the specific circumstances of a Tokyo river bed or a steel plant in the French countryside to touch on something more universal. They do not make us think in terms of years, or even decades, but rather in terms of epochs. Of his many series, Blast is perhaps that which illustrates most explicitly and viscerally the central concerns that drive his work. While visiting the limestone quarries he photographed in Lime Hills, he was frequently confronted with the controlled explosions that are used to mine the rock. He eventually decided to focus on these blasts themselves, using a remote radio-controlled motor drive to take a rapid-fire series of photographs that capture each phase of an explosion from the detonation to the dust settling in its aftermath. 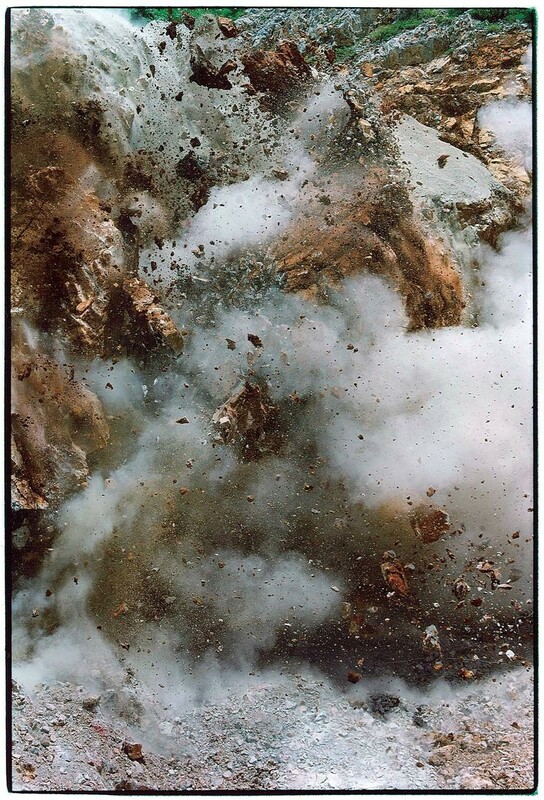 These images place the viewer in the center of each blast, surrounded by fragments of rock that seem to hurtle toward us, revealing both the force of the event but also an undeniably seductive beauty. The brutal energy of this series may seem to contrast with the quiet beauty of many of Hatakeyama’s other bodies of work and yet he has never sought to depict the beautiful in his images. Instead, throughout his career, Hatakeyama has explored the notion of the sublime, that which inspires awe in us. That sense of awe runs throughout his work: it is present in the void he explored beneath the city in his series Underground (Tokyo) and Ciel Tombé (Paris) just as it is in the altered landscapes of Lime Hills or in the dismantling of a coal wash plant in Zeche Westfalen I/II Ahlen, but in Blast it arguably reaches its apogee. In fact Blast is the most direct study of what may be Hatakeyama’s central theme, the efforts of man to build the modern world, from and in the natural landscape. Limestone is the only minable resource in which Japan is self-sufficient and it is the central ingredient in the cement of the buildings that crowd the country’s dense cities and the roads that connect them. As such the explosions depicted in these photographs are foundational moments, the first steps in the construction of the country’s modern civilization. On the surface the vast body of work Hatakeyama has produced over the past thirty years may appear to be divided between the two distinct, or perhaps even opposing strands of nature and the city. But he is not driven by dichotomy or a desire to warn us of the dangers of man’s intervention on the natural landscape. Instead, his images reveal the fates of the natural and the man-made as being inextricably intertwined. Unlike much contemporary landscape photography, Hatakeyama’s images do not read like cautionary tales about the threat faced by a specific place at a specific time. While they are resolutely modern, his images are invitations to consider the very foundations of our civilization. Just as they stretch deep into the past, they also open up the possibilities of our distant future, filling us with hope and terror in equal measure.